Sure, something the researchers come up with might be the next big thing and make the company a bundle, but it’s a heck of a lot of fun just poking around to see what’s possible, which is precisely what I did on a visit to the Sony Computer Science Laboratories (CSL) in the steaming heart of Tokyo this morning. The Sony CSL Open House is a once-a-year invitation-only event held over two pretty ordinary floors of a Shinagawa office building but showcasing enough daydreaming gadgetry to get the most hardened otaku hot and sweaty. 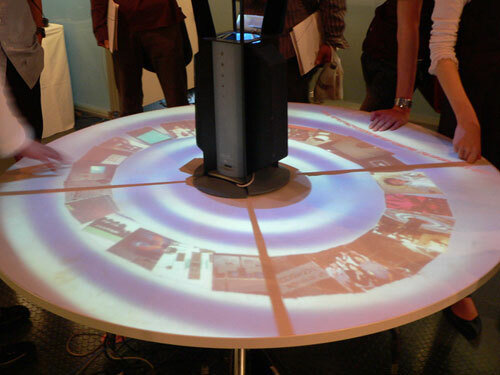 Although much of the work on show was pretty conceptual, the display that got most visitors gawking was a circular table known as ChatScape. 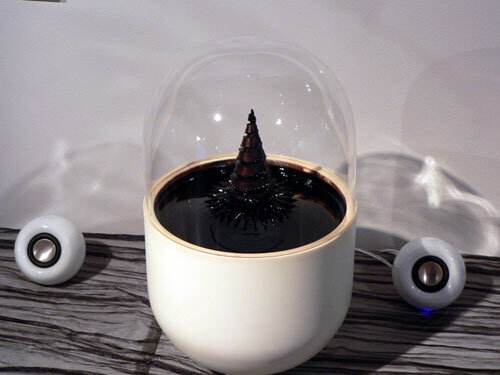 The device was really just a laptop connected to a top-down projector in the centre of the table that threw rotating images onto the flat surface below, but the novelty of emailing it snapshots from your cellphone and seeing them appear on and swirl around the table was worth the trip alone. Putting such frivolity to one side, the next-biggest draw was a huge display emphasizing just how significant the PlaceEngine technology we saw at work in the PSP earlier this week will be soon. 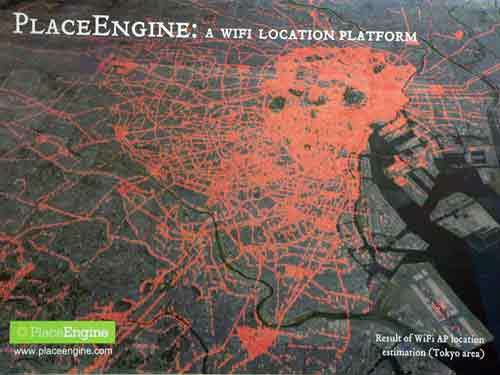 PlaceEngine – to put it simply – uses Wi-Fi as an alternative to GPS for pinpointing physical locations. Most excitingly, it has a strong element of user collaboration – earnest strollers armed with a PDA, PSP or other PlaceEngined-up piece of kit can contribute to a Wi-Fi map that grows in accuracy as folk tell it what precise location corresponds to a particular Wi-Fi signal pattern. Researcher Atsushi Shionozaki demonstrated how he had used a version of the software he hacked together on his smartphone to map his travels around Tokyo last weekend and to combine it with a chronological record of his iPod-listening habits that day. With a spot of online information sharing, it would be a simple matter to see, for example, what track fellow geeks listen to under a particular overpass. In this case, it was – no surprises – a certain Red Hot Chili Peppers’ classic. On the hardware front, Shionozaki also showed a prototype key-ring equipped with the PlaceEngine software that can track a wearer’s movements throughout the day and synchronize later with photos, for example, and demonstrated a device already capable of just that. 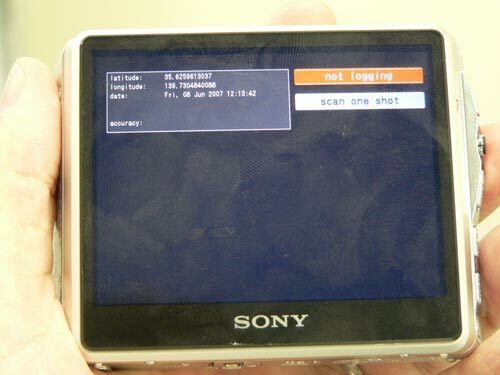 The Cyber-shot DSC-G1 digital camera already has onboard Wi-Fi, but an adapted version was on show also with PlaceEngine software for geotagging all photographs. Naturally, all this Wi-Fi mapping requires the presence of a Wi-Fi signal, so it’s limited to urban areas like downtown Tokyo for now. 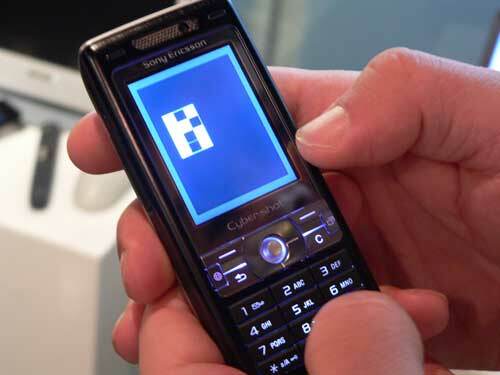 One of the other CSL projects most likely to succeed was a nifty little piece of graphics software for cellphones by Ivan Poupyrev. It might not sound like much, but the ability to draw realistic icons and avatars directly on a standard (non-touchscreen) phone is sure to add appeal to users of mobile social-networking sites. Poupyrev’s software relies on mapping the keypad’s buttons to a 3x4 grid of pixels on the screen – pushing a button turns the corresponding pixel on or off, while holding a second button simultaneously allows for a spot of greyscale. Touch another key and the grid zooms in to allow work on a much finer scale. It might sound complicated in theory, but in practice it was a breeze to draw pretty sophisticated graphics with just a handful of keys. With a color version on the drawing board, watch out for this one for sure. Elsewhere, a system for creating manga-style comic-strips from cameraphone photographs and a new CAD application that virtually constructs not just the surface of objects, but also their interiors are worth keeping an eye on in future. The former will inevitably appear on Japanese phones before long, while the latter has medical and educational applications in that it allows for more realistic simulations before surgery or in lessons. Although there was far too much on display today to cover in depth here, there was a clear emphasis on what many predict will be the boom technology of the next few years – social networking in all its forms. Existing websites, such as Facebook and YouTube, already make plenty of hay in the collaborative/sharing sunshine and it’s obvious that it won’t be long before major manufacturers like Sony enable many more of their real-world products to get friendly with each other – and with every man and his dog, which is a whole other can of worms, of course. Sponsored links: Download high quality EX0-101 dumps to prepare and pass iseb certification with 650-195 exam dumps certification. Also get free demos of ccnp for review of 70-516.